Couple weeks ago I joined Pinterest cos I saw awesome DIY ideas, that even me, a clumsy two left handed creature can do 0_o. As I spent more time on the site I found of course more categories of pins, where one of course was FOOOOD :P. Nothing new or weird. I started browsing and found this interesting recipe for beef meal. The pin on the Pinterest led me to blogchef.net where I could read and learn how to make this incredibly tasty dish. Of course had to change some things cos of our likes and dislikes but the end result is 95% of the original recipe I believe. 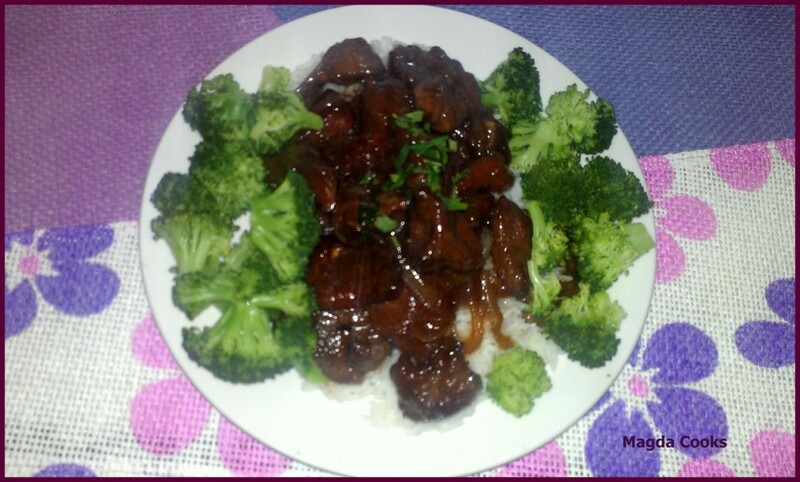 I served it with my favourite basmati rice and steamed broccoli florets. 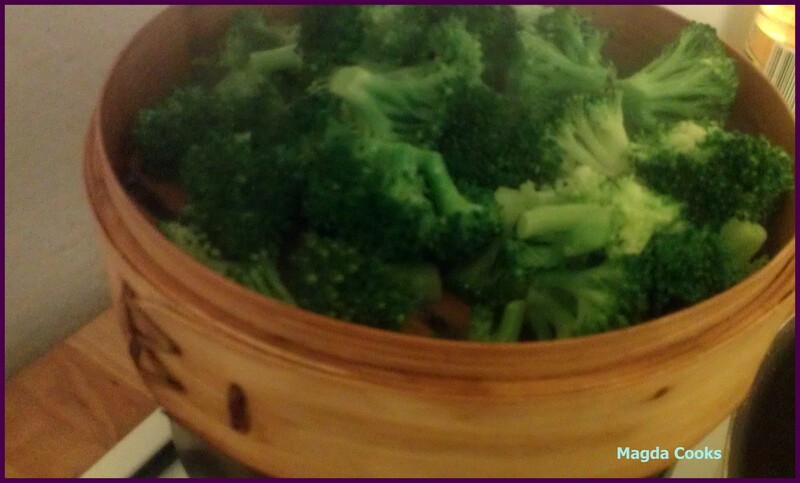 I have this nice rustic asian bamboo basket for steaming food, it’s really neat, cos I could place it over boiling rice and steam it along. Flush the meat under cold water and pat it dry with paper towels. Cut it against the grain into not too thick slices, the best would be one or two bites size. Put it into a bowl and sprinkle with the starch and set aside for at least 10 minutes. Make sure you won’t skip this step, because it’s very important for the rest of the meal. While waiting for the beef, prepare the sweet-spicy-sour mixture. In the saucepan add 2 tbsp. of oil – heat up. Peel with a spoon (learned from Pascal Brodnicki) ginger and grade it on the small edges of a shredder. Toss into pot along with a garlic powder, stir fry for 10s. Add soy sauce, rice wine or vinegar and water. After another 10s add brown sugar, stir to make sure sugar dissolves in the liquid. Add cayenne pepper and boil for another 2-3 minutes, then set aside. In the frying pan with high sides or a wok add a good amount of oil and heat it on high heat. Put meat in and deep fry for 3-5 minutes – it should be brown and crispy. After the meat is done, drain it on paper towels. Remove most of the oil from the pan, leave like 2 teaspoons. Cut onion into feather like pieces and put into the pan and stir fry for 2 minutes, put the meat in and pour the sauce mixture. Boil until the sauce thickens and starts bubbling. Until next time, take care of yourself and each other 0_o. P.S. Cookies thoughts: Seriously MORE, MOAR, and MORE? 🙂 this was spectacular and that is being modest… I loved it.